The Web Marketing Association, sponsor of the annual international WebAward competition, today announced the findings of a decade-long study of Web development trends across more than 80 industries. 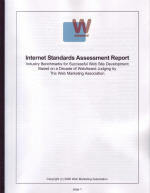 The resulting Internet Standards Assessment Report provides industry benchmarks for Web site development and is based on data collected from nearly 10,000 Web site evaluations. The report reveals that gaming Web sites dominate the top scores in every category, followed by music, which placed second overall, and automobile and sports Web sites, which tied for third place. The industries with the lowest average Web site scores included radio, public relations and search engines. "According to our professional judges, design, ease-of-use and innovation are the most important contributors to a Web site's success or failure," said William Rice, president of the Web Marketing Association. "However, our results found that industries overall excelled in content and copywriting over design and ease-of-use, which may close the door to many users. Innovation, while critical to a Web site's success, actually received the lowest average scores across all industries. We believe this is due to the fact that innovation is so elusive and difficult to maintain - what is groundbreaking in one industry may be commonplace in another." Gaming Sites: These sites feature experienced designers who understand the intricacies of Flash animation and the benefits of online communities, including message boards and chat features. Targeted to a younger audience, these sites focus on providing a user experience that is on par with the actual gaming experience. Recent best of industry winners include: Star Wars Mercenaries Game Site, SOCOM II: U.S. Navy SEALs and Disney's Hot Shot Business. Music Sites: Users come to music sites for the content, but they stay for the experience. According to Rice, "Music sites have conquered the age-old dilemma regarding the use of technology, where too little equals boring and too much means the site can be overwhelming. The music sites we've evaluated over the years have demonstrated the ability to build a loyal following by effective uses of technology to stream rich media content without sacrificing usability." Recent best of industry winners include: Red Bull Music Labs, Sting: Public & Pay Member Site and Live365. Automobile Sites: One of the most hotly contested industries, automobile sites realized early that customers were most likely to engage an auto brand in the privacy of their home or office, rather than in a showroom with a commission-driven sales person. As a result, this is one of the few industries that has beaten the average scores for the WebAwards every year since the competition's inception. Recent best of industry winners include: Volkswagen 2005, Toyota Scion and The all-new XJ online campaign. Sports Sites. These sites benefit from a fanatical fan base who count on their favorite Web sites to stay in-the-know about sporting news and events. Therefore, it's no surprise that this industry ranked highest in the areas of design and content. Recent best of industry winners include: Nike Basketball, RBK Sound and Rhythm and Prince Tennis Website. "As Internet bandwidth developed, so did the ability for Web sites to deliver a dynamic rich media experience that merges online entertainment with e-commerce to create a compelling interaction for users," added Rice. "While content is still king, it's a Web site's ability to interact with users in interesting ways that keeps an audience coming back." Other noteworthy industries include retail, healthcare and travel. Retail-oriented sites, including shopping, auctions and catalogs, ranked highest for interactivity. These sites allow for personalized cross-selling and detailed product information which are not always available in print catalogs or off-line stores. Similar to the automobile industry, the retail industry has succeeded by maintaining its off-line brand presence online. In the healthcare and travel industries, content, copywriting and ease-of-use dominated the scores due to recent changes in industry dynamics. "An important trend we're seeing in healthcare and travel is disintermediation," said Rice. "For example, the healthcare industry previously relied completely on service providers for patient interaction, but new legislation has opened the door for direct-to-consumer initiatives. As a result, the healthcare industry has become very competitive in the areas of content and copywriting as consumers are turning to these sites to become better informed before deciding on a course of action with their doctors." "A similar scenario exists in the travel and leisure industry, with the practical elimination of travel agents," continued Rice. "These Web sites have demonstrated a strong showing in both copywriting and ease-of-use as Web sites integrate effective copy with strong images to create a lifestyle experience for the user, allowing them to make better choices for themselves." Radio Sites. These sites rank particularly low in the areas of innovation and use of technology. This is surprising given the industry's ability to harness rich media similar to music sites. While radio station sites can draw upon music for content, they often try to cram their homepages with so many options that users can feel lost and overwhelmed. Public Relations Sites. While advertising sites excelled in design and innovation, public relations sites ranked low across all categories. Notably, public relations scored lowest for copywriting, even though it is an industry known for effective communication. According to Rice, "It's likely that PR practitioners focus more on developing their clients' sites, while their own sites suffer from typical 'brochure-ware.' Another possibility is that the low scores reflect the informal nature of the Internet and the backlash over over-edited, corporate speak." Search Engine Sites. While search engines are dominating the buzz around the Internet industry as a whole, these sites rank lower than average in every category, except ease-of-use. In fact, search engines received the lowest scores for use of technology even though the behind-the-scenes technology driving search engines is so sophisticated. These low scores can be attributed to the spartan nature of most search engines which allow the results to speak for themselves. "Of course, in every industry, there are Web sites that stand out and others that don't make the grade," concluded Rice. "Our goal has always been to be more than just a popularity or beauty contest that rewards brand names and good design. Instead, this report is designed to take a decade's worth of judging scores to define what Internet marketing professionals should strive for in their Web site development efforts." Great summary Steve, thanks! It's interesting that ad agency sites ranked high, because I tend to think of them as generally underwhelming.